CSC(Common Service Centre) is a project under digital India to provide service in rural and remote locations. The services provided by the CSC’s are such as B2C(Business to citizen), health related services, education services, insurance services, bank and aadhaar related services and many more services. Also Read : CSC digital seva : A to Z Full Explained !! The services provided in all areas where connectivity of internet is less than another area. So for taking benefits of all the services provided by CSC, first you have to complete the registration process of CSC . 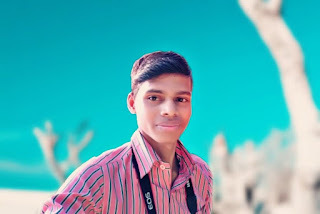 Here I am going to tell you about CSC registration 2019 and how to register yourself on this site for taking benefits of all services provided by CSC. 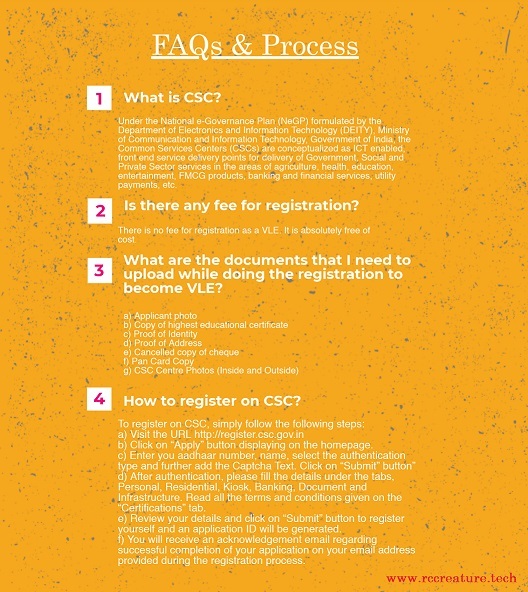 Here are some steps for CSC Registration 2019. But before, make sure you have kept all of these required documents which are mentioned below ! How to Apply CSC Digital Seva Registration in 2019? If you are going to register yourself on CSC then first you have to full fill eligibility criteria form which is available on the CSC portal. After this, you can apply for the registration form of CSC. 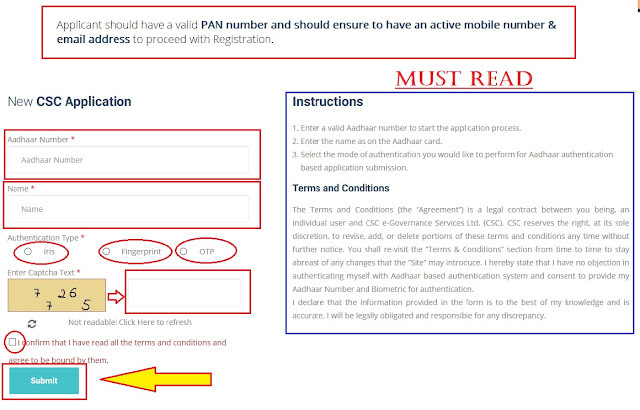 Here are the full steps for CSC registration by following you can easily full fill the registration form. Click on “Apply” button displaying on the homepage. Enter your Aadhaar number & Name . Select the Authentication type ( You can prefer any of the KYC options like iris, fingerprinting or one-time password if bio-metrics is NOT available. ) and fill the Captcha Text. After authentication, please fill the details under the tabs, Personal, Residential, Kiosk, Banking, Document and Infrastructure. Read all the terms and conditions given on the “Certifications” tab. Next, Review your details and click on “Submit” button to register yourself and finally, an application ID will be generated. You will also receive an acknowledgement email regarding successful completion of your application on your email address provided during the registration process. How to Apply CSC Re-Registration 2019 ? Candidates can also re-register themselves on this portal. It's same process as you read above for csc registration . Here are steps for the re-registration process. Follow these steps and easily re-register yourself on this portal. Remaining steps followed by authentication of your aadhaar number through KYC. After that fill the given captcha and click on the submit button. After completing the authentication process of aadhaar, a form will open. Then fill all the details mentioned in the form. Then your new CSC re-registration will be completed. After this, an acknowledgment/Application number will be given to you for references. How to Check CSC Registration / Re-registration Status ? Enter your received Application ID/Reference Number and fill the captcha in the required box. Then you will notice your CSC Registration Application Status as written Processing/Successful on your PC/smartphone display ! Or, you may go through this !! Select “Application Status / Status "
=>> There is no fee for registration and re-registration process. So be aware from any of the fake website and person and do not pay any amount to them for registration. =>> If you are applying for registration and your application get rejected, then do not worry you can apply again for registration by following the same procedure. Do let me know if you have any doubts regarding csc registration 2019 in comment box below . Thank You !! Glad this helped you ! 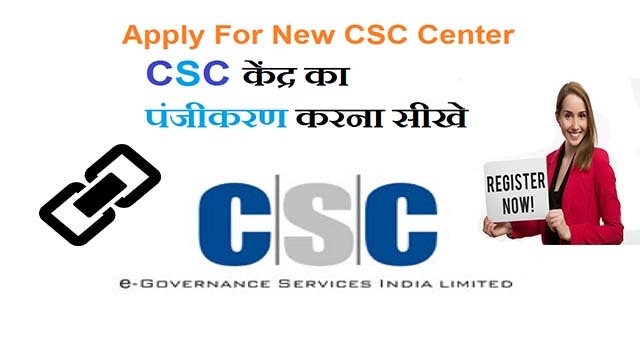 You can apply for csc registration 2019 now. It's now opening ! I registered for CSC long back and recently I got a mail having the digimail credentials.Here I don't know what to do next to get all the CSC services and how to start use it. 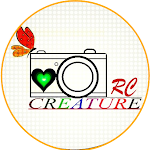 Can you please help me on this? sir mai CSC registration krna chah raha hu but ho nhi raha hai . kya aap bata sakte hai kyo nhi ho raha hai . I have mentioned all steps above. Please read carefully and follow those ! Good Luck ! !